Construction began September 4, 2018 on Edgewood Avenue (State Road 111) from U.S. 1 to the Moncrief Creek Bridge, including the entry and exit ramps for Interstate 95 within the project limits. The project includes removing and replacing the top layers of asphalt on the roadway and interstate ramps, base work, shoulder treatment, drainage improvements, curb and gutter work, traffic signal updates, lighting, highway signing, guardrail work, sidewalk repair and other incidental construction. 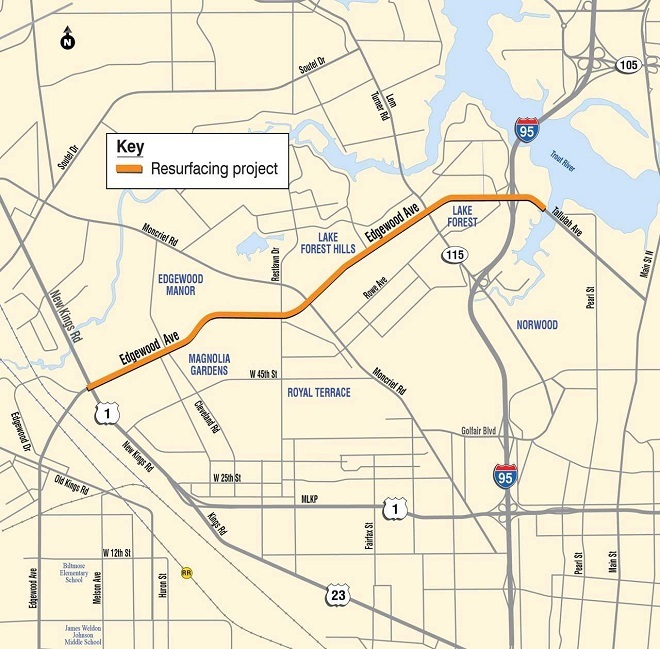 Traffic will be maintained in accordance with FDOT design standards throughout the project. Drivers can expect periodic single lane closures on roadways and bridge ramps during off-peak driving hours. Lane closures may occur from 8:30 a.m. to 4 p.m. and from 7:30 p.m. to 6:30 a.m. Monday through Friday. Lane closures may occur anytime Saturday and Sunday without restriction. FDOT will coordinate with local schools to avoid interference with pick up and drop off times. JTA bus stops will remain in place, and bus routes will be operational throughout construction. Sidewalk closures may occur during the project; however, pedestrian detours will be provided. Hubbard Construction Company will complete this $6.6 million improvement project in summer 2019, weather and unforeseen circumstances permitting.